Naruto, I'm sure nearly everybody has heard this somewhere. Naruto is a Manga and Anime series started by Masashi Kishimoto. The first Manga volume was published in 1999 by Shueisha and the first episode aired on October 3, 2002. This series has gained quite a lot of fame over it's years and has grown to be one of the most popular anime to be animated and one of the top Manga to be written. The Manga has sold over 130 million copies in Japan alone! To many, anime isn't worth the time or is rather boring. But to some people anime is an escape, a form of entertainment, and maybe even a way of life. Naruto paved the road for a lot of people who are now huge anime fans. Personally, I used to hate anime and then I watched Naruto, now you will find me all over the anime section on this site. Some people despise Naruto due to it's fillers, or non story related episodes, but if you can look past that or even learn to enjoy them Naruto is a spectacular story. Now if you look at the beginning of Naruto and compare it to today's date that is quite an impressive time frame for a Manga and Anime to be airing. It is one of the longest airing anime and Manga of all time, alongside others like One Piece, Detective Conan, Bleach, and Fairy Tail. Naruto also has 9 movies (and another one releasing in December 2014), 2 OVAs, 6 Specials, and a stunning 56 video games! Now that you have a little history information about Naruto let's get to the point. 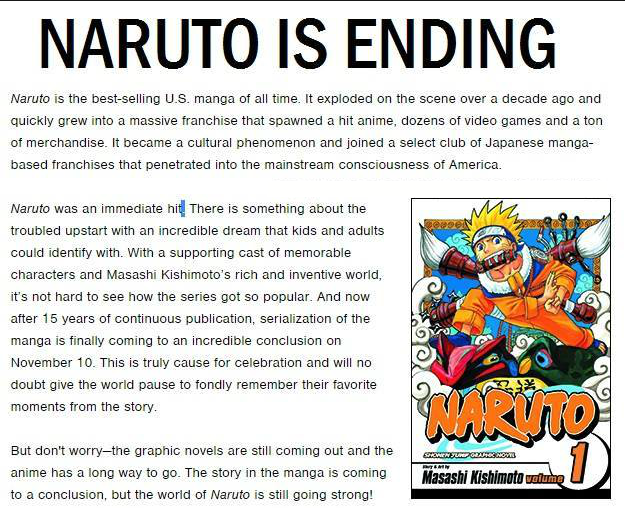 If you have been keeping up to date with the news on Naruto then you may already know that it will be ending soon. Well, Kishimoto has officially announced the ending date for the Naruto Manga, which will be November 10th 2014. This will not affect the anime as it's not up to date with the Manga. Also, Kishimoto stated that this is only the end for the Manga and that the world of Naruto will still continue with Light Novels and other various things. This is devastating to many Naruto fans out there, but everything must come to an end at some point. It was a great run for Naruto and Kishimoto did a wonderful job. Oh, and if you're a good artist, or at least think you are, you may want to try and submit your fan art to this page for a chance to have your artwork featured on the cover of a Shonen Jump Magazine!